RandomKid is an organization that my daughter has been involved in for about a year. I wrote about the organization here. It is a unique organization because it is focused on kid initiated, kid directed projects. Check out the project page of their website. These aren't adult projects where kids can participate. These are projects that kids have thought up, and through the support of their parents, families, friends and RandomKid, are either making a difference or a looking for the funding to start. Here is their latest newsletter. I post it to bring encouragement and opportunity. Share it with kids that you know. Maybe one of them has a project idea that RandomKid can help them start. Watch NBC Nightly News This Sunday, December 23*for a Special Report on RandomKid's Water Project. I’m really excited for you to read what we have to share with you in this newsletter. RandomKid’s National Task Force to Rebuild the Gulf, a group of 10 kids from around the country, had the opportunity to visit the largest chapter of Habitat for Humanity, tour and volunteer in the gulf, thanks in large part to a grant from Target Corporation and a kind invitation from the Mississippi Gulf Coast chapter of Habitat for Humanity. Our mission was to witness the progress that’s being made, the work that still needs to be done, and report back to kids across the USA to encourage continued support. There are still nearly 60,000 people living in FEMA trailers over two years after Hurricane Katrina. Faith has helped them all get through a tough time. It is a message we hear from everyone over and over again. They also are being helped by Habitat for Humanity, the Salvation Army and the countless volunteers that go down there to rebuild homes. But none of this can happen without money. We can’t allow ourselves to be tired of the story because it’s old news and we want to move on to something new. We have to commit to helping every last hurricane survivor back on their feet. It is the patriotic thing to do, and our human responsibility to help people who can’t help themselves. We need to show them that the power of their faith can also be seen in each of us, their fellow Americans who care. All but one of the articles here were written by the RandomKid Task Force kids. One column was written by our newest Board Member, and dad of one of our Task Force members, Ed Brenegar. Please take a moment to see the gulf from a kid’s point of view. We hope you’ll help. Nasheka Chatman and her three children met with the RandomKid Task Force on a warm Fall day in Biloxi, Mississippi. Chatman has been living in a FEMA trailer with her three small children and her husband for over two years now. The FEMA trailer that the Chatman family is currently living in is 10 feet by 40 feet, or about the size of your garage. They are very cramped and there is not a lot of privacy. When Nasheka was asked how she has gotten through everything over the past two years, she replied, "with prayer, lots of prayer." Chatman says she has had lots of support from family and friends. Of all the things that this family lost, what they miss most are family pictures. She wants other people to know that Habitat for Humanity was "sent by God. The people were sent by God." Nasheka's children, ages 4,6 and 7 have put lots of thought into what colors they will paint their new bedrooms. The family is moving into their Habitat house on November 12th and they are going to celebrate by making a sign for the front yard that says, "Thank You Jesus for our new home." Chatman reminded us that, "People on the Gulf are doing okay. We still need you're help, but we are okay. People here are strong in their hearts." When asked what other Katrina victims should remember, she thought for a moment, then added, "Don't give up on your dreams [of getting out of a FEMA trailer and into a new home]." As the jazz music dies; the scent of beignets disappears; the wrought iron architecture ends; and the skyline of the French Quarter blends in with the horizon, the memory of the destruction comes back to mind. The bus rattles and shakes along the highway. We pass abandoned homes and empty lots – painful reminders of the past. I can’t help but think of everything lost during the storm. There are so many still left with so little. It makes me feel like I need to do more. Money is really necessary to help others. I am reinvigorated. I am inspired to take up the task where I left off. I will once again look for new and creative ways to get others interested in the Gulf Coast disaster. So many have forgotten. But not me. I want to help the poor people of Mississippi and Louisiana. And I will. Click here to DONATE to RandomKid’s “Rebuild the Gulf Fund.” 100% of your donation will go to our “Rebuild the Gulf” program, 90% of which goes directly to building a Habitat for Humanity house in Biloxi, MS.
Our day started with a LONG bus ride! During the ride we rode on the bridge over Lake Ponchartrain. It was really scary because the bridge went on and on for miles over nothing but water! It was a funny feeling! When our ride was done we ate brunch at Court of the Two Sisters in New Orleans! It was really good food, and they had a jazz trio playing that was fun to listen to. I tried crawfish for the very first time (I don't think I'll try it again for awhile! ), and I also tried grits (I'll pass on those next time too!). But the omelets were super, and so were the desserts! After brunch we went on a ferry ride across the Mississippi River. It was really cool! Even cars could drive right onto the ferry so they could cross the river! That was a strange sight! After the ride we went to the Swamp Fest at the Audubon Zoo. It was neat seeing al those animals! It's hard to believe that alligators can be so dangerous because they looked really lazy and didn't even move a muscle! Next we went to Cafe du Monde (that's where the picture of the task force above was taken), and ate bengiets. They tasted like funnel cakes at our State Fair, only better! I ate three! We then had about an hour to walk around in the French Quarter and do things. It was really fun. My mom and I had a street artist draw our caricature! We look kinda funny in it...he gave us real big heads and big teeth! Then we went to the "old" Brock Elementary in Slidell that had been destroyed by Katrina. We interviewed the principal, Rose Smith. The school was all boarded up, but they're working on the inside and hope to be in by next school year. We then saw the current school the Brock students are in. They all have double-wide trailers for their classrooms. It was neat seeing all the things they've been through and knowing that they have never given up hope. Their trailer classrooms were actually very, very nice and big. It was a nice feeling to know the kids can have good classrooms until they get back in their real school. At the end of the day we ate at the Southside Cafe. It was really good food...I had fried oysters! I like oysters anyway, and these were yummy! After that we went back to our stadium and went to bed. It was a good, busy, and tasty day! “We are honored to be hosting these children here in the gulf. They have proven to be a driving force in bringing awareness to our gulf rebuilding efforts, and we hope that their reports from the gulf will inspire many more children around the country to continue to help rebuild the thousands of homes that were destroyed by the 2005 hurricanes.” ~Kent Adcock, Director of Business Development & Community Relations for Habitat for Humanity of the Mississippi Gulf Coast. It all started with our carabiners. You know, those cool clips you can stick on your backpack, key chain, and just about anywhere else (They make GREAT GIFTS—HINT HINT!! Click here to buy some!). Click here to read backstory on carabiners. Kent Adcock with the Mississippi Gulf Coast Chapter of Habitat for Humanity received a carabiner at Habitat for Humanity’s “1000th Home Celebration.” He thought they were pretty cool, and called us up to see if we’d partner with them to sell carabiners with their logo and our logo on them at a big event with professional golfers in November. Next thing you know, he invited the task force to come! But we still had a big hurdle: How to pay for everyone to get there. That’s where Target Corporation comes in. Hooray for Target! They helped the entire task force come together in the gulf. The Task Force has worked together for over a year, and finally met in person for the first time. We stayed in the Salvation Army’s VolunteerVillage in Biloxi, MS. The Salvation Army ROCKS! We met a really great kid named Conner there. He and his family moved to Biloxi to help the Salvation Army after the 2005 hurricanes, and they’ve been serving volunteers in the MS Gulf Coast now for a year and a half. I am happy to say that Conner is the newest member to our task force! There are many more stories to tell. 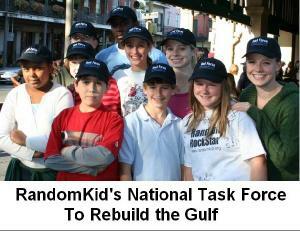 "RandomKid National Task Force to Rebuild the Gulf" members met kids who had to swim through their house to get to safety, parents who lost everything. Can you imagine having survived such a disaster and then living in temporary housing for over two years, knowing that there may be thousands ahead of you on the building list? GOAL: Break ground on a RandomKid / Habitat for Humanity house in Biloxi in 2008 = $25,000 needed! The children on the Task Force were so moved by what they saw, that they have decided to set a goal to raise enough money to break ground on a MS Gulf Coast Habitat for Humanity house in Biloxi in 2008. These kids have already raised a lot of money with their entrepreunrial ideas. They need to raise $25,000 more to be able to break ground on a house. Please help these kids make their goal, and help a family into their home. In the coming months we'll share more of stories, photos and video from the Task Force trip. We'll also introduce you to the new things they are doing to help our fellow Americans in the gulf. Thank you for not only helping the gulf, but helping KIDS realize their power to help others. I written about RandomKid previously here . You are going to hear more from me about RandomKid. I've just joined their board. I believe in their mission. I endorse their - our - mission because it is about the Kids and their ideas, and their leadership and their impact. Your financial support will help kids make difference. I hope you'll consider making a donation. You are not only investing in the future, but making a difference today.